As I was setting the table for dinner tonight I thought I would snap a few photos to share. This is just a simple impromptu fall setting pulling together a few autumn colors. I substituted a pair of 14" round Tava chargers for a tablecloth. They are crafted of beautiful rattan. I've had these for a couple of years now, but don't seem to use them enough. 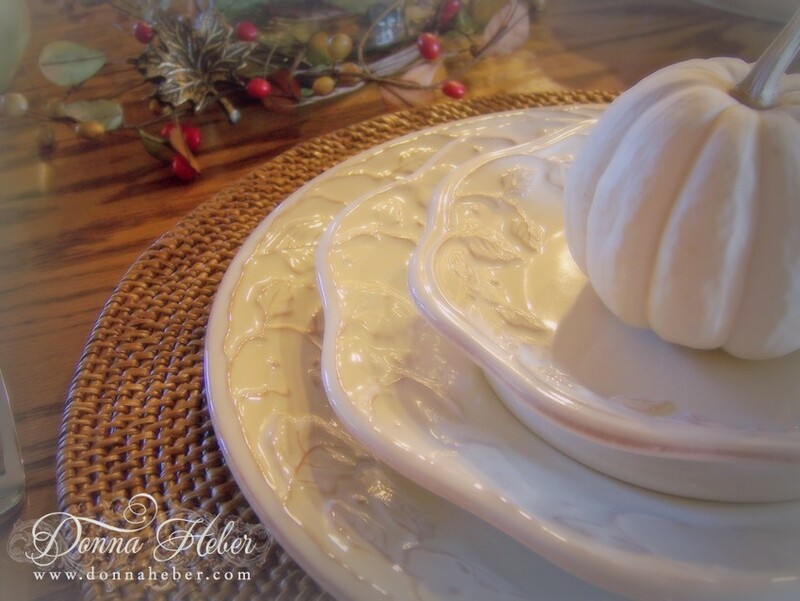 Longaberger Vintage Vine pottery, inspired by the Ironstone pottery that was made and imported from England in the mid-1800's brings a timeless elegance to the table. The lovely shade of cream beautifully contrasts with the soft brown color that is hand-rubbed over the embossed vine and leaf design. Graceful scallops, scrolls and flutes accentuate each piece. I will be using this dinnerware set until the winter months. 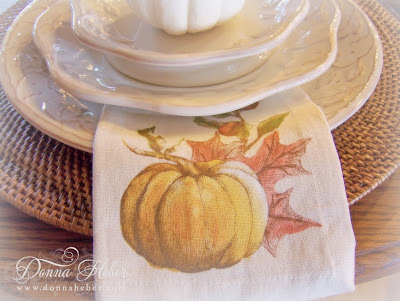 Harvest pumpkin napkins are my favorite! This glass hurricane has been around for ages. Today it is filled with faux leaves and acorns. 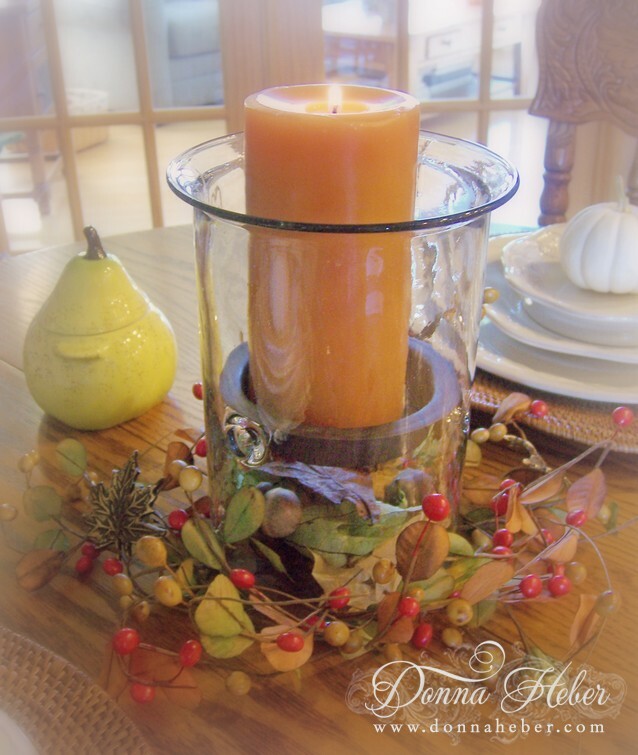 It is a nice versatile piece I can decorate for the seasons. Enjoying dinner by candlelight is so romantic. The petite pear casserole is by Le Creuset. It is adorable and looks just like a fresh-picked pear. This stoneware is great for dips and side dishes. Wouldn't it be dreamy filled with a delicious pear cobbler? Oh, I must be going now as I heard the oven beep. I wish you a wonderful evening. After dinner I plan to curl up by the fireplace with my kitty Cheops. 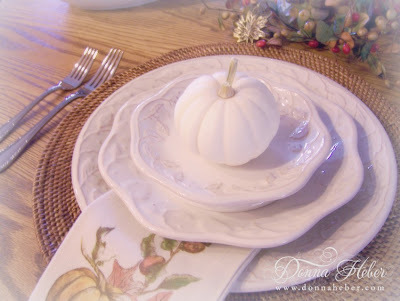 Very Pretty Table setting! Have a very Pink Filled week end! 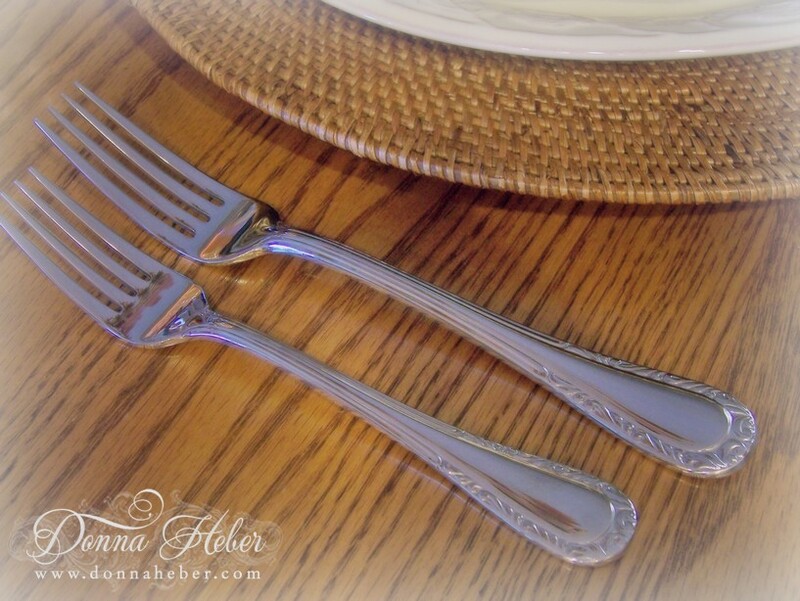 Beautiful table settings and photos! I love things like the hurricane glass you can change seasonally. I like to change things often, so having pieces like that (and neutral dishes) helps a lot. Hope you have a terrific weekend. This is a lovely fall setting. Makes me all set to sit down to Thanksgiving dinner! 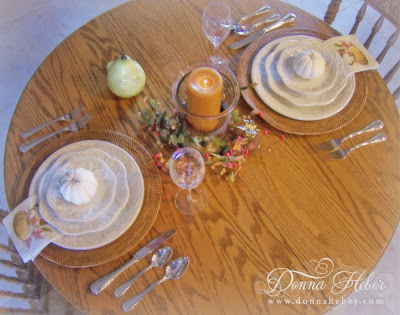 wow beautiful dinner set Donna. Love your table setting, Donna. It looks like you and I like many of the same things. And, we have a round oak table in our breakfast room. Happy Pink Saturday and Pumpkins & More Pumpkins. I love this tablescape. The napkins are so pretty I almost bought the same ones. 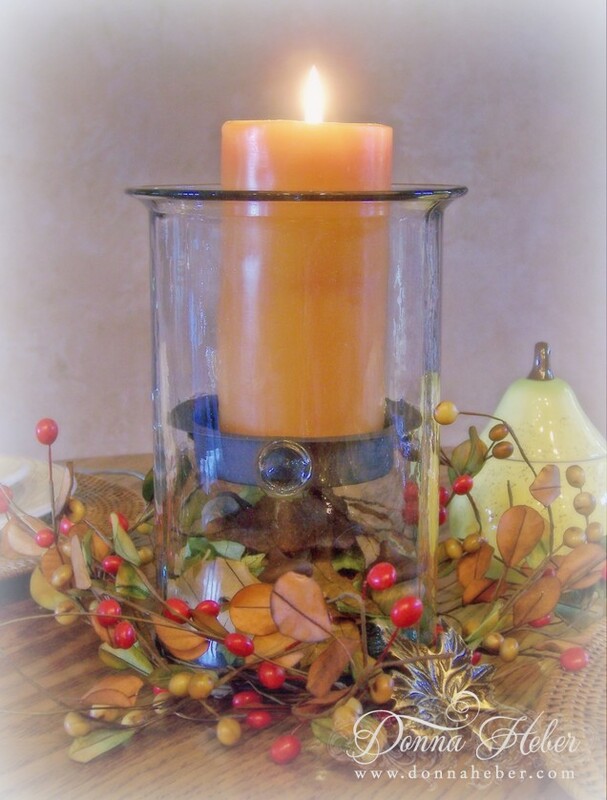 The centerpiece is beautiful. Beautiful pictures too. Beautiful table. Those charges look super with your white dishes. I love your napkins too! Sometimes impromptu settings are the best! Simply gorgeous! I am the featured blog this week, hope you can drop by. Beautiful fall table, love the napkins. 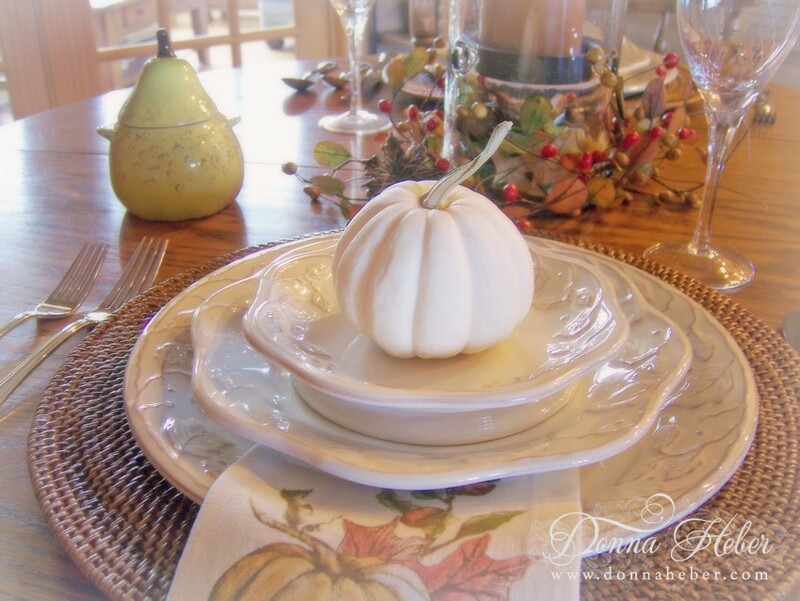 Hi Donna: What a beautiful table you've set--I love the round rattan chargers, and your lovely china. Plus I like your after-dinner plans with Cheops--that sounds like the best--kitty snuggles by the fire! It's been cooler here, and we've had all three cats in bed with us the last couple of nights! You set a lovely table my friend. 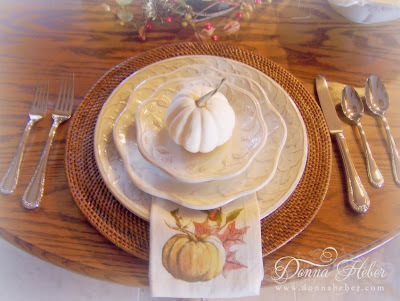 The napkins are wonderful Autumn touch too. Thank you for sharing at the Thursday Favorite Things hop xo P.S. did you enter my latest giveaway?